Along this pipe, the roles of producers and consumers are generally clearly defIned with a consumer of one segment being the producer of the next step of the chain. However, following rapid growth of network connectivity technologies, platform businesses have seen a surge in popularity. Platform businesses are businesses which use technology to connect corporates, individuals and resources for the exchange of physical goods, services or information. Roles between producers and consumers which were previously clearly delineated are now blurred. An individual can be simultaneously a producer or consumer depending on the transaction with a platform facilitating two-way interactions between participants. Facebook is a prime example – individuals create posts while simultaneously consuming news, photos or videos from others. Airbnb itself does not hold any physical inventory, yet has the ability to match accommodation availability with market demand for millions. Its participants may both rent out or rent an accommodation. The list goes on: Amazon, eBay, Uber, TaskRabbit, Lyft etc. In all of these, success is built on economies of scale, in which the larger the platform’s network, the more value it provides to its participants. 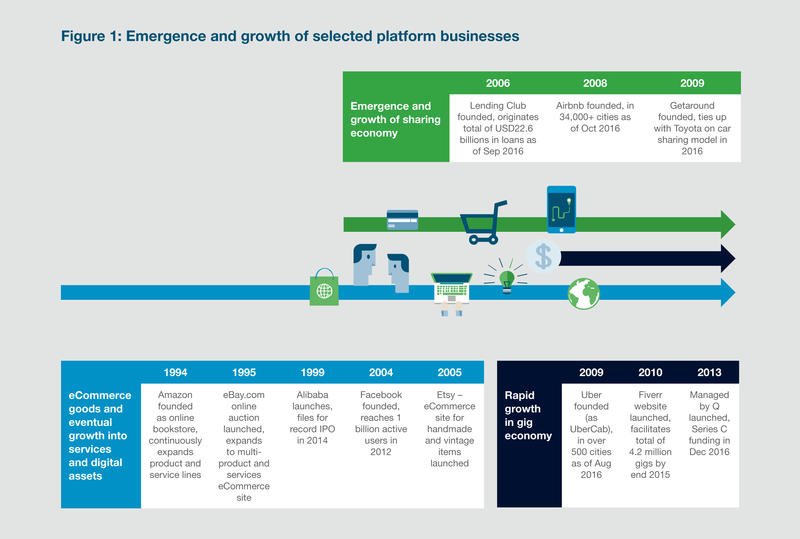 While most initial forms of platform businesses were eCommerce companies, where physical goods were offered via a portal (e.g. Amazon), this eventually evolved into e-marketplaces allowing for exchange of goods and services between individuals (e.g eBay). The sharing/rent economy also blossomed in parallel, whereby platforms for sharing or renting of assets (e.g. Airbnb) grew in number and size exponentially in the past decade. Today, we regularly hear or read about the rise of the Gig Economy, and platforms such as TaskRabbit matches individual short term labour supply with tasks. Platform businesses may also straddle multiple customer and product segments. For example, qoo10.com acts as marketplace for both goods and services. Fiverr provides services from both business and individuals for a wide range of tasks. 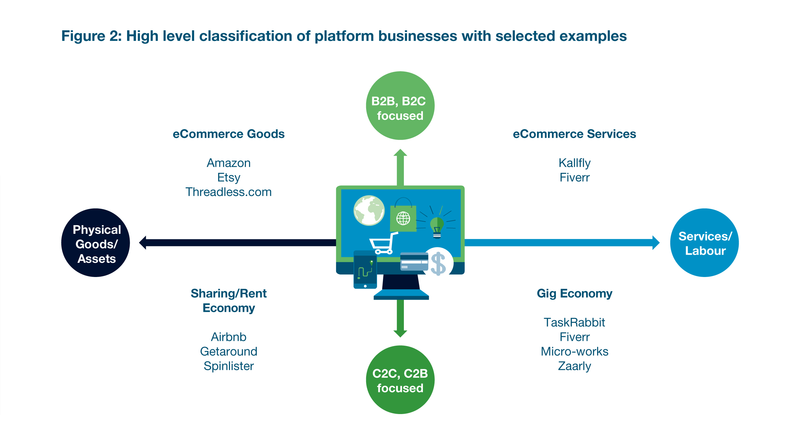 A simplified segmentation breakdown of the different platform economies is shown in figure 2. As businesses move to a platform-based model, the buying behaviour of each participant and corresponding payments characteristic has also evolved. While in a pipe model, payments tend to be aggregated for execution in fixed time periods and generally are preceded by a legal contractual arrangement, the payments for a platform-based model are generally fragmented and “just-in-time”. For example, where salaries are traditionally paid on a fixed schedule and constant in value, compensation in the gig economy is ad-hoc with varying value for each gig. As platform businesses proliferate, non-bank e-payment service providers have likewise grown to meet the demands of such businesses. For example, Alipay, the payments arm of Chinese eCommerce giant Alibaba has grown to become the preferred payment method for most Chinese consumers, much more than either cash or cards. 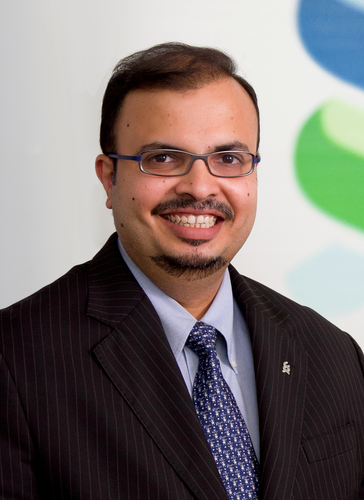 Banks therefore need to innovate and leverage the latest technologies to remain competitive. This requires in-depth understanding of corporates’ and consumers’ requirements. For a large multinational corporate conducting eCommerce business in multiple regions, this may mean requiring a portal which allows customers to pay in any payment method, without having to deal with the complexity of managing multiple merchant acquirers or payment service providers. This is especially pertinent for corporates seeking to grow their eCommerce business in regions with highly fragmented regulatory landscapes, such as ASEAN. Such conditions are ripe for API Banking, leading to standardised, seamless machine-to-machine payments, which execute “on-demand”. Banks have to rise to the challenge of API Banking which would be crucial in delivering for open-model platform businesses. For an individual in the gig economy or a leasor in the rent economy, this may translate into the need for a low-cost seamless “pull” payment capability, allowing them to request for a payment via mobile or other channels in a seamless authentication process without compromising on security. There is also a demand on national clearing infrastructures to rise to these challenges. It is therefore crucial for banks to track developments in Immediate Payments implementations such as FAST in Singapore or UPI in India. At the risk of overhyping the benefits of blockchain and smart contracts, these technologies will also play an important role in creating trust and effciency in the decentralised platform economy. In the true sense of a platform-based economy, banks should also explore the ways to leverage resources in the gig economy for selected labour-based banking activities such as cash collections, so as to improve and achieve service levels in line with the new economy. Shirish is our Global Head for Correspondent Banking Products for Transaction Banking. Based in Singapore, he heads the Clearing & Trade product strategy for Corresponding Banking and drives the commercialisation of the Bank’s investments in SWIFT gpi, Distributed Ledger Technology (DLT) and Ripple.